Kids love to write funny sentences but often get stumped just thinking about what words they want to use. These free writing mats give them a fun way to practice their writing. 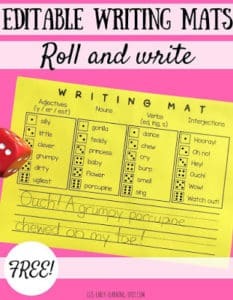 Just roll a die 4 times to determine which words will be included in the sentence, then craft and write it. It’s editable too, so your kids can decide what words they want included on the mats, which makes it excellent for kids at different levels! Pop over to Liz’s Early Learning Spot to download it!